Living Space: 10000 sq. ft. This Hobie Farm With Ocean Views And Multiple Homes Is Now Only $720,000!!!! This amazing estate property will blow your mind!! Located in Portalon, just a few kms north of Playa Matapalo, it has easy 2 wheel drive access, it’s minutes to the beach, and half way between Dominical and Quepos. A 3 min drive off of the paved highway brings you to the impressive gates that open to a long private driveway. The main 3 bedroom, 3 bathroom house was built 30 years ago and has more character than any other house that I have seen in Costa Rica! It is build from exotic hardwoods, has river rock walls, red brick and hardwood floors, huge windows, original custom made wooden doors, and 2 huge outdoor patios!! There is also a studio style guest house that is under renovations but would be easy to finish up. There is also a 3 bedroom, 1 bathroom caretaker’s house built with the same character and style as the main house. There is a huge 2 car dehumidified garage with several large storage bodaegas inside. Above the garage is a second storey open air loft that could easily be converted into more living space. As if that isn’t enough, there is a large shop with a 2 car covered carport as well. Every building on the property has a nice ocean view. All of these building have recently been renovated and modernized! 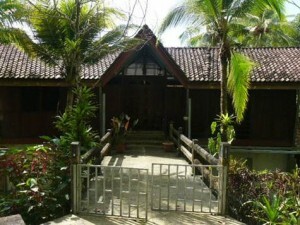 The property is extremely well landscaped and has countless fruit trees. A good portion of the property is jungle with some massive old growth trees and tons of wildlife. There are several more building sites and the property is subdividable. The neighbour has 1200 acres of protected forest that wraps around this land. I can’t describe in words the beauty of this property. The lower half of the property is open flat pasture land perfect for a small hobby farm. There is plenty of room for horses, cows, chickens etc. Properties this nice are hard to find.